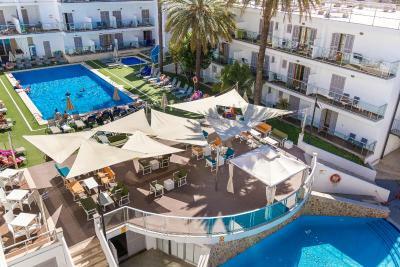 Lock in a great price for Eix Alcudia Hotel - Adults Only – rated 8.5 by recent guests! Short walk to the bus stop and ferry terminal. Functional room. 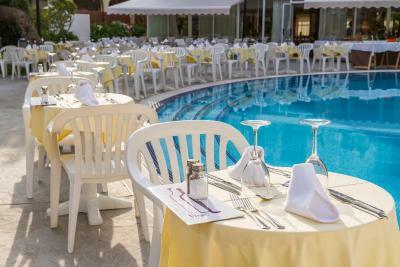 The bar, pool and Spa areas were very good and the staff were excellent and very helpful. Hotels location and access to the large municipal free car park which is adjacent to the hotel, means that it offers an excellent base from which to walk, cycle or use a car from. The breakfast was fantastic, The amount of options were excellent with great variety. The room was well equipped and bed very comfortable. Excellent breakfast buffet. Nice and polite staff. The staff are friendly and efficient. The hotel has excellent facilities and is a very short walk to the beachfront. Food in the hotel is to a high standard. 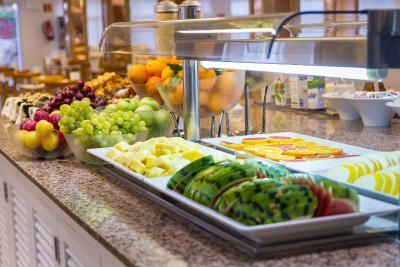 The breakfast has just about everything you can think of and buffet dinner is available too, with a very wide selection of food that represents good value for money. There's plenty of parking in a large carpark opposite the hotel. This was our second stay in this hotel. Breakfast and dinner was an absolute feast! Huge choices of every type of food! Delicious ! Hotel was spotless and all credit to the staff. Rafael in the restaurant couldn't do enough for us! We were thoroughly spoilt! So appreciated the beautiful fresh flowers throughout the hotel. Facilities were amazing and free including jacuzzi, sauna and gym. 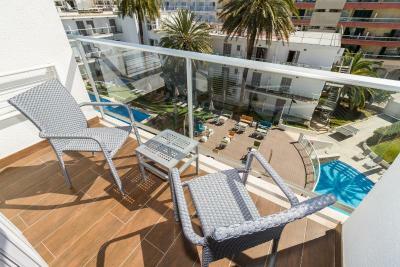 Plenty of loungers around the pool and towels are provided! Fabulous stay! 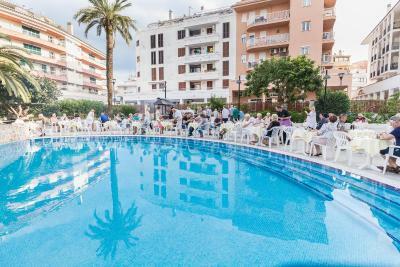 Eix Alcudia Hotel - Adults Only This rating is a reflection of how the property compares to the industry standard when it comes to price, facilities and services available. It's based on a self-evaluation by the property. Use this rating to help choose your stay! One of our best sellers in Port d'Alcudia! 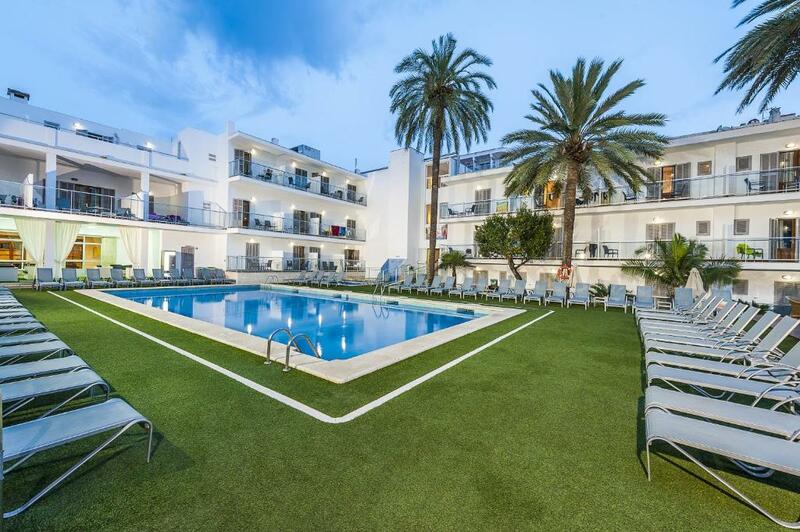 This traditional Mallorcan-style building consists of 4 floors set around an outdoor swimming pool and patio, surrounded by palm trees. 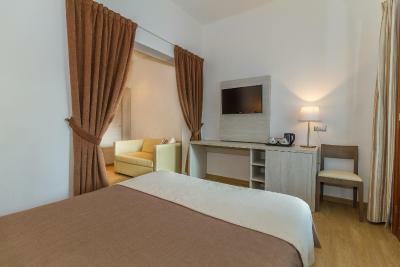 The heated, air-conditioned rooms come with work desk and satellite TV. 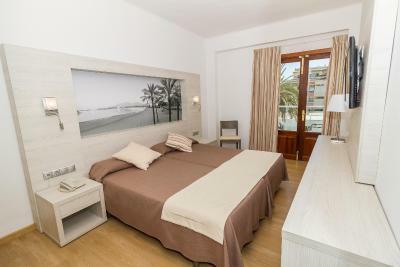 Hotel Eix Alcudia - Adults Only lies within 500 feet from the beach in Puerto de Alcúdia, in northern Mallorca. The Medieval town of Alcudia is less than 0.6 mi away. Double rooms at the hotel offer a private terrace, some with pool views. 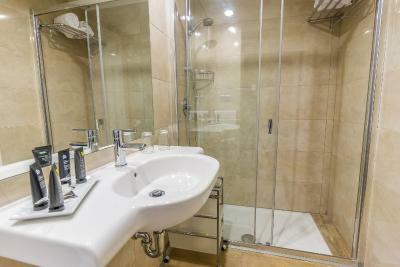 All rooms are en suite, with amenities. 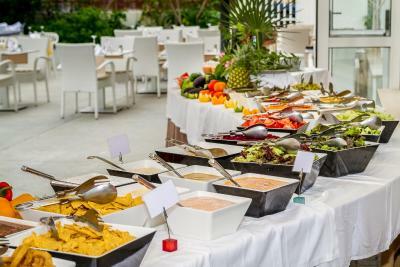 Guests can enjoy meals at the hotel's restaurant. 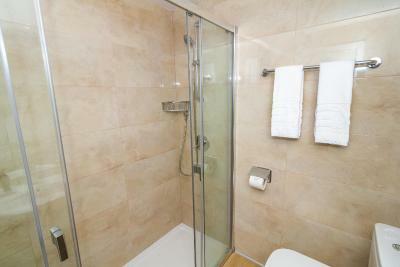 Other facilities at Hotel Eix Alcudia include showers on the ground floor for late departures. Secure bicycle storage and free outdoor parking are also available. 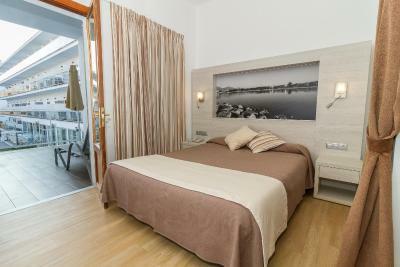 When would you like to stay at Eix Alcudia Hotel - Adults Only? 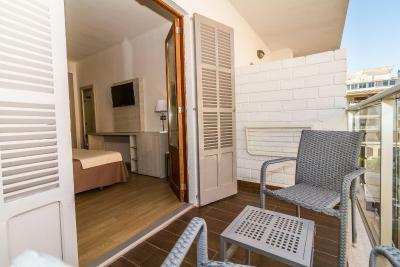 This simple, air-conditioned room features a balcony, a TV and free Wi-Fi. The private bathroom includes free toiletries. 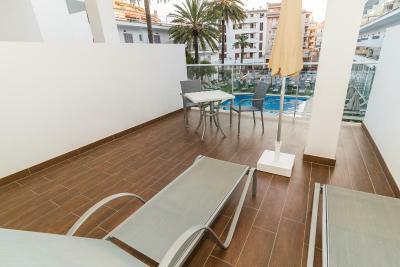 This air-conditioned room has a balcony with views of the swimming pool and a flat-screen TV with satellite channels. 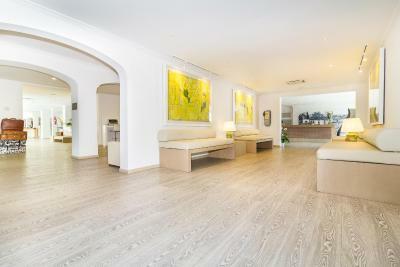 House Rules Eix Alcudia Hotel - Adults Only takes special requests – add in the next step! Eix Alcudia Hotel - Adults Only accepts these cards and reserves the right to temporarily hold an amount prior to arrival. Please note that the hotel can provide the details of a transfer company to arrange transfers from/to the airport. 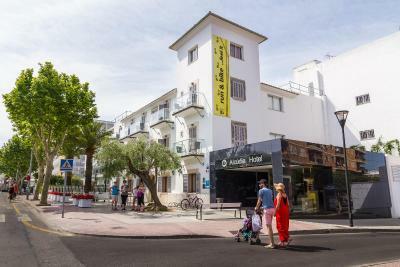 Modern, clean and quiet hotel (with soundproof windows) right downtown Port d'Alcudia. Swimming pools, good and varied breakfast, friendly reception. Restaurants, ATMs and supermarkets all within easy walking distance. Don't let the absence of a private parking put you off - the public one right in front of the hotel is large, free and safe. Excellent base if interested in Baleares archeological sites: Cà de Picanfort is only 15 minutes away and Port d'Alcudia is the ferry departure to hop over and see all the others in Minorca. My room was right next to the reception area and not soundproofed, so it was really noisy mostly in the morning, starting from 6 a.m.
Great location, friendly staff, nice, clean rooms and comfy beds. Can walk to one of the longest and best beaches in Mallorca in 2 minutes. Next to some great tapas and has a modern stylish interior. Would stay again. road Works outside hotel dust etc not hotels fault but would like to have been told. I thought the property was fantastic value for money and there is nothing that I disliked about it. 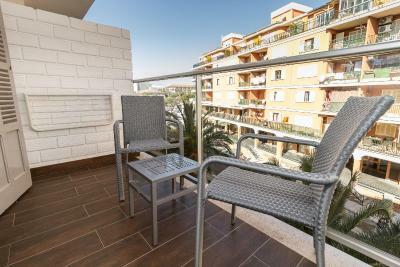 Fantastic location, right around the corner from the beach and various restaurants. Facilities were good, well maintained, comfortable rooms with balconies. The breakfast was a massive selling point, plentiful, great choice and top quality. We also had a bike garage to store our kit, complete with pumps, washing facilities and all day access. We'll definitely use Eix Hotel again. Everything. Great hotel, looked after our group superbly (25) Very friendly and helpful. Breakfast was great and plenty of it no waiting around. Rooms were smart and well looked after. We will be back. The hotel is incredible noisy. The walls are really thin, generally no sound proofing. Great with adults-only concept, but sound proofing is essentiel. Beds were a little bit hard and room looked a little tired. Room was positioned very close to bar area and therefore noisy on nights of live music/bar. 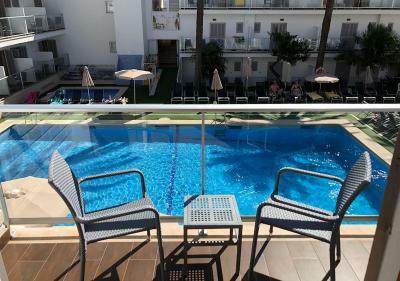 The facilities were great- nice pool and sun lounger area. Great spa facilities which was a nice added bonus! And location was excellent. Very little not to like about this hotel. Facilities and food were excellent. Central location for my needs and great for those on a cycling holiday. Great accommodations for cyclists. Options are available as regards food. Limited health spa facilities available. Not much to comment on. While I was there there was work being carried out on the road outside the hotel, but that's not anything that falls on the hotel at all. The staff were extremely friendly and welcoming. I was travelling alone so this was greatly appreciated. Rafael was a shining example of making me feel welcome in a strange place, he went above and beyond to make me feel valued. Bike storage services was also excellent, being allocated a 'parking' space in a well kept bicycle garage in the basement complete with bike wash. 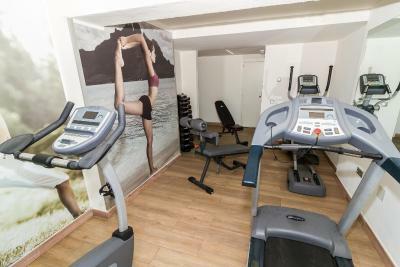 The hotel itself is very well kitted out with loads of different places to opt to relax in, be it outside, by the pool, in the bar, in a cosy living area. The orange juice was better than last year, but still not excellent. The mattress on the bed was starting to get a bit tired and could use replacing. Fabulous hotel. Breakfast amazing. Two great swimming pools. Staff helpful and friendly. 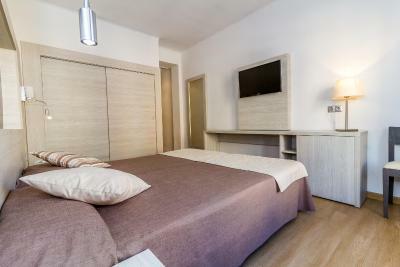 Hotel location close to beach, restaurants and shopping. Room cleaned everyday and bed and towels changed everyday.